The history of gaming is littered with examples of gaming consoles that were conceived, designed, and even built without ever reaching the market. Some had makers who got cold feet at the last minute. Others were eclipsed by other possibilities their developers found more attractive. Still others fell prey to corporate politics and intrigue. And sometimes, somebody simply had enough sense to say, "Maybe a console that can only play games like Night Trap is a bad idea." This is exactly what it sounds like: a videogame console co-developed by Nintendo and Sony. In 1988, before the Super Famicom/Nintendo had even been released, Nintendo was already exploring the idea of creating a CD-ROM peripheral for it. The technology was new and exciting. Replacing ROM cartridges with optical media promised vast increases in storage space and huge decreases in production cost. The bloated, vulture-encircled corpse of the Sega CD did not yet exist to provide its baleful warning. Nintendo couldn't go it alone, though. Compact discs were quite new at the time - in 1988, it had only been six years since the first commercially released CD, and three years since the first CD-ROM. Instead, Nintendo formed a partnership with one of the two electronics companies that had jointly developed the technology, Japanese electronics giant Sony. A deal was struck. Sony would develop a CD-ROM add-on for the Super NES using a new CD-ROM format that could efficiently access visual data, audio, and game code simultaneously. In June of 1991, at the Consumer Electronics Show in Chicago, Sony revealed one of the fruits of their labors - the "Play Station," (note the space) a combined system that played both Super NES cartridges and "SNES-CD" games. The next day, Nintendo announced at CES that they were terminating their partnership with Sony and would instead be developing a CD-based add-on for the Super NES system with the other company that had co-developed CD technology - Dutch electronics giant Philips. Under their agreement, Sony controlled the SNES-CD format, which meant that Sony, not Nintendo, would control games licensing for Nintendo's CD add-on. Nintendo, famously persnickety about controlling what was released for its systems, didn't like this. Why they ever agreed to it in the first place isn't clear, but Nintendo eventually thought better of it and signed a more congenial deal with Philips in May of 1991. Next month's Consumer Electronics Show was the natural place to unveil this exciting new partnership. And so, like a pro wrestler who doesn't realize his tag-team partner has turned heel and is coming up behind him with a steel chair, the Play Station marched obliviously to its doom. What was Sony to do? Well, they say the best revenge - at least nowadays, when duels to the death or tricking someone into eating their own children is frowned upon - is living well. Sony took what they had, developed it further, and made their own console. And they already had a name. Meanwhile, the SNES CD drive to be developed by the Dutch floozy Nintendo jilted Sony for never materialized. 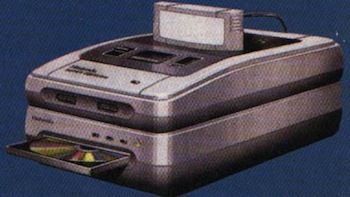 This did not prevent Phillips from using one of the benefits they received in their contract with Nintendo, the right to use Nintendo characters in games for Phillips' own ill-fated CD-i system. This resulted in such timeless classics as Zelda: The Wand of Gamelon and Link: The Faces of Evil being added to the Legend of Zelda canon. Such are the wages of treachery.